If you enjoy this newsletter, please recommend it to a friend! Looking for hands-on math projects? Out-of-the-ordinary science experiments? Writing challenges that spark the imagination? Keeping up with rigorous academic standards can, and should be, inspiring. Oak Meadow's award-winning preK-12 homeschool curriculum offers a full year's worth of engaging assignments, creative projects, and uniquely flexible weekly lesson plans to get you inspired and back-to-school. Families also have to option to enroll in Oak Meadow School for faculty support, fully accredited official school transcript, and printed course materials for one full year. To find out if Oak Meadow is right for you, visit their online grade-specific curriculum samples, or call to speak with one of our Educational Counselors. You might also want to sign up to receive their informative (and free) quarterly journal, Living Education. Free time was once the hallmark of childhood. But these days, many parents feel it's their duty to keep their children busy. This mindset can be found in parents who both work outside the home and need somewhere for the kids to go during off-school hours, parents who compete with other parents regarding whose child is the most "well-rounded", parents who want to give their children every so-called "advantage", and parents who believe their children will fall behind or get into trouble unless their schedules include every activity that can be crammed into each day. The result is a generation of children who are so accustomed to organized activities that they don't know how to entertain themselves (unless there's a television or video game nearby). They're the total opposite of the kind of workers needed to grow our economy in the future. America needs creative innovators, not passive participants or couch potatoes. So if you want to encourage your children's natural creativity, reduce the amount of time they spend in scheduled activities, and give them more free time instead. What is free time? It's unstructured. It's not directed by adults. It requires that children move through boredom in order to arrive at the place where the innate creativity of the child kicks in and comes up with something to do. But many parents dread the thought of free time for their children, because they know it will be a matter of moments before the "I'm Bored!" chorus begins. If you have children whose time has always been planned out for them, they won't know what to do with a lot of free time at first. But if you stick to your guns and require them to entertain themselves on a daily basis, they will (perhaps out of desperation) figure it out. So what will they do with all their free time? They can make things and work with their hands. They can use their imaginations to come up with games, structures, even toys. In the absence of planned activities and formal schedules, children are incredibly good at learning from their play. They just need enough time to do so. Children also need time to be alone so they can think. In this frantically scheduled world we live in, even adults find they don't have time to just sit and think. But quiet introspection is important for everyone, young and old. It's particularly important for those who create things. Much solitary thought is required for pursuits such as writing, painting, inventing, etc. Free time isn't only a necessity for small children; older children and teens need plenty of it, too. Many extremely creative people are late-bloomers (as Edison was). They need ample time alone as they grow older and discover what their gifts are, and how they want to use them. Unfortunately, parents and schools tend to increase the outside activities of teens just when they really need their personal time. Tightly scheduled lives are detrimental to creativity. In 1996, Harvard Business School professor Teresa Amabile, an expert on creativity and business innovation, led a research project to study creativity in the workplace. Amabile and her team pored over almost 12,000 journal entries from over 200 people working on creative projects in a variety of different companies. One of their most important conclusions was that time pressure actually decreases creativity. While many people (myself included) feel that working against a deadline makes them more productive, it may not make them more creative. It takes time for creative ideas to grow and develop in our minds. The Amabile study found repeatedly that creative people on a tight time schedule found their creative abilities hampered not only up until their deadlines, but even for a few days afterward. What this means for our children is that they need regular free time in order to feed the creativity and spirit of innovation they were born with. It takes time to get deeply involved in a creative pursuit; as parents, it's up to us to make sure our children get that time. Your feedback is always welcome! Just send your email to heather(at)familyclassroom.net. "We have been super structured homeschoolers, as well as tried our hand at unschooling, but I think for us Oak Meadow is the perfect balance. I want my children to not only be well educated, but completely educated. The way that Oak Meadow allows for the entire person to grow is truly beautiful." "I tell people all the time how thorough and fantastic this curriculum is. My children...do not take well to memorization or workbook assignments. They love the hands-on approach and are learning to learn." "If you want to love homeschooling, use Oak Meadow. Have faith in it and enjoy it. It's more than a curriculum, it's a guide for a wonderful lifestyle of learning with your family." 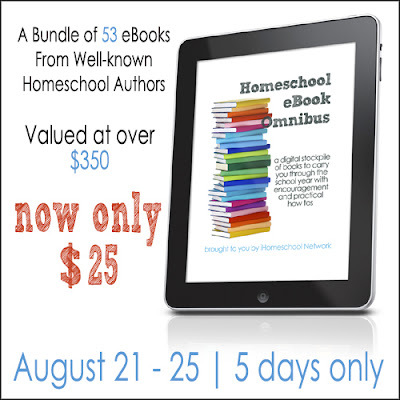 Check out this amazing deal from well-known homeschool authors -- but hurry, it all ends on Saturday, Aug. 25th! "Boredom and a lots of available books is what saved my spelling as a homeschooled kid. We had no TV, and there were plenty of stretches of time where my friends were in school and I had tons of books laying around. One thing led to another. Not sure how that would have worked out if I had siblings, however -- my parents might have had to enforce quiet time in that case!" -- Gandalf H.
"Hi, Beth! Both of my boys (age 8 and 13) are reluctant spellers. We have been using SpellingCity because it seems to work more than anything else. While we don't use Sequential Spelling as a program, there are tons of members who have shared their spelling lists on the site. I have used those. I can also create my own, which helps keep their interest (I will make lists from current books they are reading, favorite movies, special occasions, etc.). Test Me again, at the end of the week. Send it to mailto:hn-questions@familyclassroom.net and we'll answer it in an upcoming issue! Feel free to send any contributions to mailto:HN-articles@familyclassroom.net or mailto:HN-ideas@familyclassroom.net.